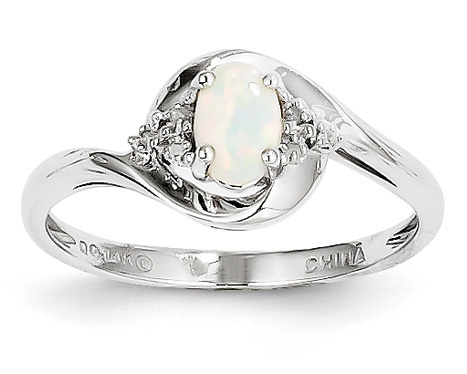 The Oval Opal and Diamond Ring in 14K White Gold offers solid proof of the timeless class of this unique gemstone. 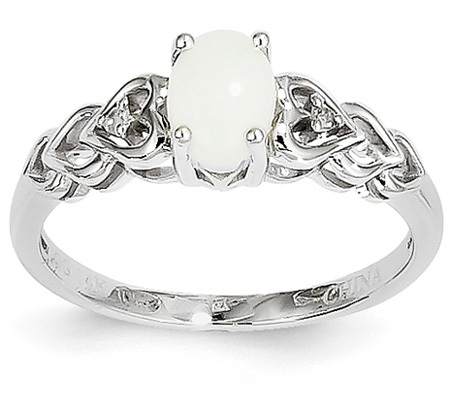 An oval-shaped opal, 3.5mm high, serves as the focal point of this classically beautiful ring. This stone is held by a shining four-prong setting and surrounded by a sparkling shining setting that gives this ring a sense of indisputable elegance. Small accent diamonds glitter from either side of this gem, while the 14K white gold band swirls around it to create a look with movement and grace. This is a ring that simultaneously displays both trend-defying glamour and contemporary appeal. The shimmering good looks of an opal make it an excellent stone for expressing a love that makes your heart come alive, and opal rings that feature heart motifs are perfect for making your affection known. For instance, the Genuine Opal Heart Ring in 14K White Gold places a 5mm-high oval-shaped opal, nearly a half carat in weight, in the center of a sweeping, shining 14K white gold heart. Two small accent diamonds provide a dose of glimmer on either side of this heart, while a gracefully-arcing band provides a fitting foundation. If you prefer a warmer look, this style is also available with a setting of 14K yellow gold. The Real Opal and Diamond Heart Ring in 14K White Gold is another elegant example of a piece that uses this shimmering stone to express love. 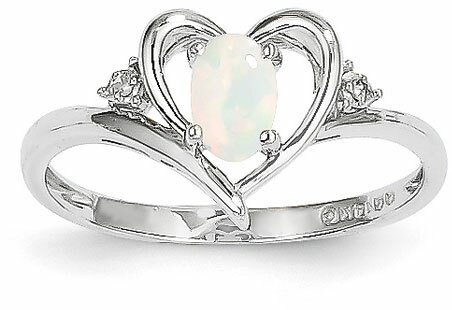 Like the ring before it, this classy piece features a 5mm-high oval-shaped opal, but this time this stone presides above a band that’s adorned with not one, but six gracefully-carved hearts. These symbols of love point upward to this stone; the two hearts closest to the opal are accented with tiny round diamonds for an extra measure of class and a touch of sparkle. Like the aforementioned heart ring, this piece is also available in 14K yellow gold. Any of these rings would be perfectly complemented by opal stud earrings if you’d like to extend the understated glamour of the opal to your ears. Whether alone or partnered with a matching pair, each of these styles will adorn your finger with a sense of undeniable subtle sophistication as it showcases a uniquely shimmering stone. 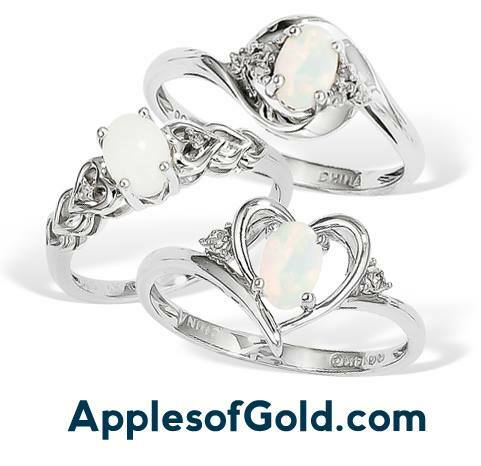 Score an Opal Heart Ring in Apples of Gold’s April Sweepstakes! « Wedding Jewelry at 10 Percent Off for U.S. Military Personnel!